another (night) ends. | "The Adventures of Lisa Lemonada"
ah well. the calls were just about moderate tonight. thankfully my “sniffles” did not escalate to full-blown flu (my throat hurts a bit though, no doubt, because of the practically ceaseless talking…er..no I’m most definitely not a talkative – with those im comfortable with i can be – person, but my job requires me to be so..”thank you for calling…” and all that sh*t). Finally I was able to submit the two new drawings I mentioned in my previous post. 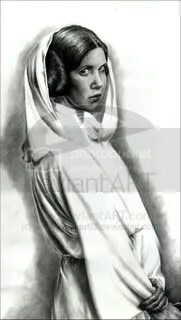 So far the DeviantArt (not to mention Phatooine.com – the SW web forum Ive been a member for about…five years now) reception to these has been great. 🙂 Thanks to those who commented and “faved”. 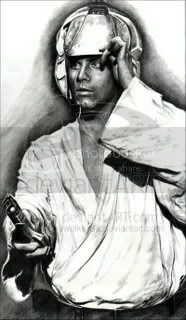 Hopefully, I ‘ll be able to start the next two pieces -“Han Solo” & “Ben Kenobi”, due to “overwhelming public demand” I think I’d start with Ben Kenobi. But that is after I finished “Harry Potter – OotP”. I’ve started the sketch (face), but my city dwelling ( ) isn’t conducive to drawing (i’ll probably be able to work on it when I come home to the province on my next off). 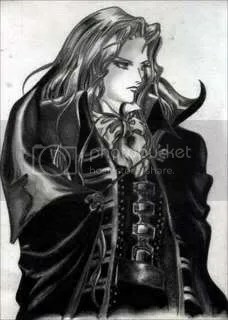 I was even able to submit something for my Minitokyo.net account, Alucard Fahrenheit from Castlevania (below), some fossil i rescued from the days of yore…:) Done specifically during my senior year (November 2000, I think). On other matters, it’s been raining nonstop for days (the streets near to where i live now resemble oceans – now that’s a bit of an exaggeration…but – ) yesterday the flood was up to my upper legs (I saw more than 5 roaches -dead, naturally- swimming in there *shudders*). I think there is a storm (i don’t know the name though, the last one was called “Chedeng”). I’m preparing to go home now, hopefully the water will have receded a bit (or else i’ll run out of something to wear, pants specifically, the one i was wearing yesterday was soaked along with my sneakers).